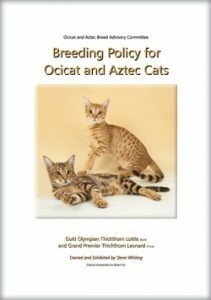 The aim of this breeding policy is to give advice and guidance to breeders to enable them to observe what is considered “best practice” in breeding Ocicat and Aztec cats. The over-riding factor should always be to maintain health, and preserve the unique qualities of these stunning breeds, type, coat colour, pattern, conformation and temperament, which make them sought after both for showing and as wonderful family pets. The breeding policy accompanies and supplements the Registration Policies and should be read in conjunction with those documents. healthy breeding practice. The General Breeding Policy offers advice and guidance for the dedicated and ethical breeder to develop and progress any pedigree breed to maintain a robust, healthy and viable breeding population of any given breed through consideration of the genetic outcome of any breeding programme. The Registration Policy for each breed given guidance and information on how to use the GCCF registers. Information includes Breed Numbers and permitted cats for outcross, how to register imports and variants, as well as listing any requirements for genetic testing. These policies are an essential asset for breeders.